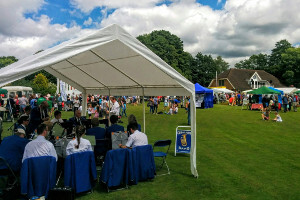 We have a selection of photos from various events over the years. 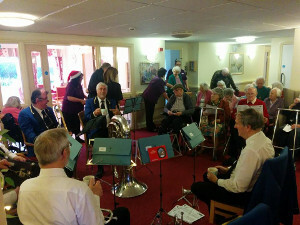 Please click on any of the pictures to view more. 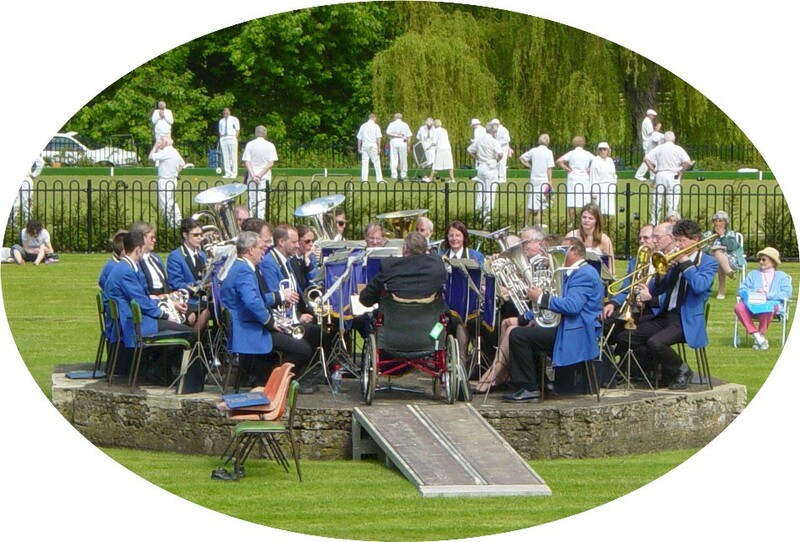 If you have pictures of the band you’d like to share, please do get in touch. 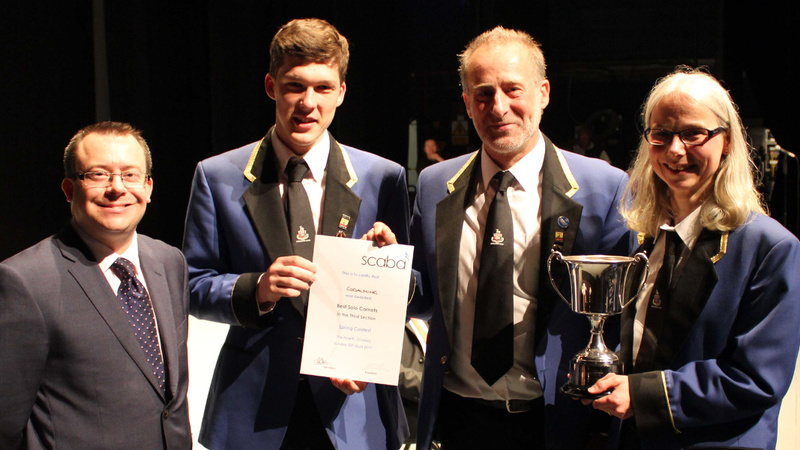 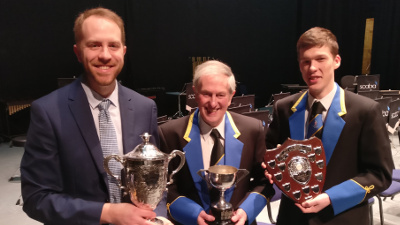 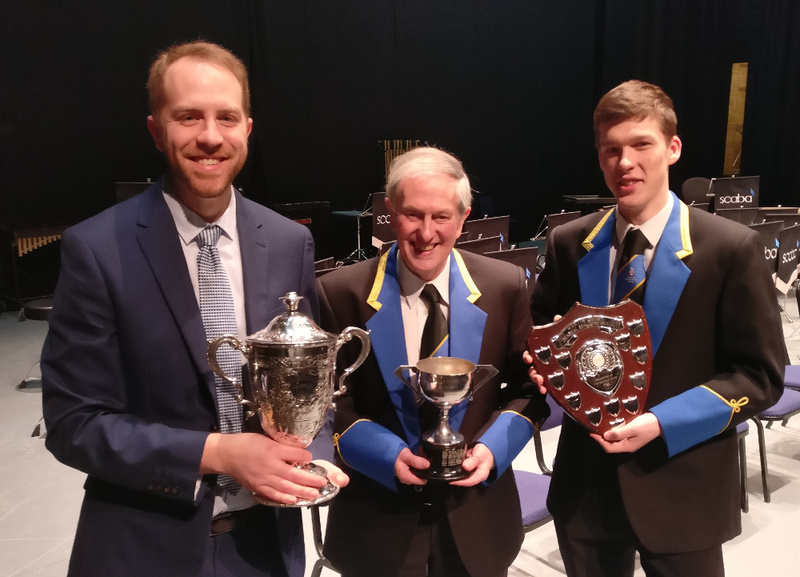 A great pair of performances at scaba contests this year secured the band the title of Band of the Year 2018 for wins in the Fourth Section in the spring, and the ‘B’ section in the autumn. 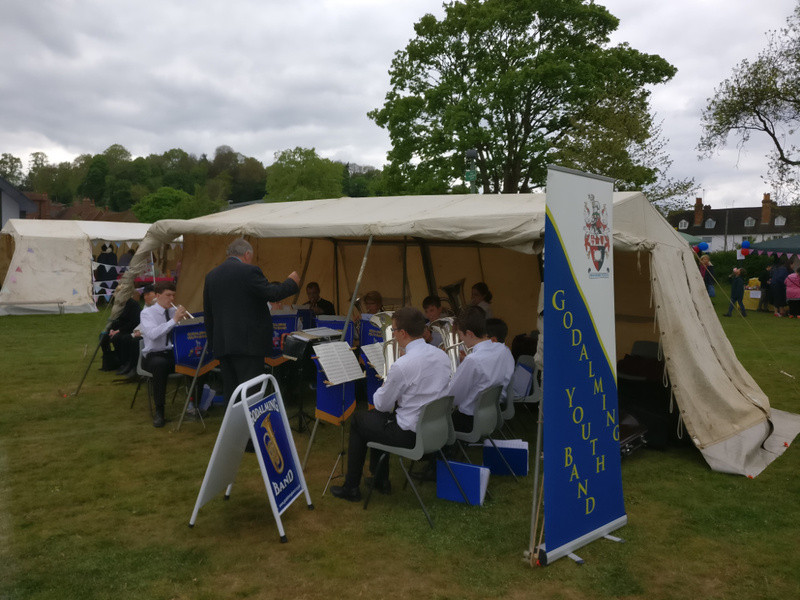 Godalming Youth Band triumphed too this year with two wins at the Godalming Music Festival in the “large ensemble” and “band open” classes, also being invited to play at the Festival Concert in Bramley. 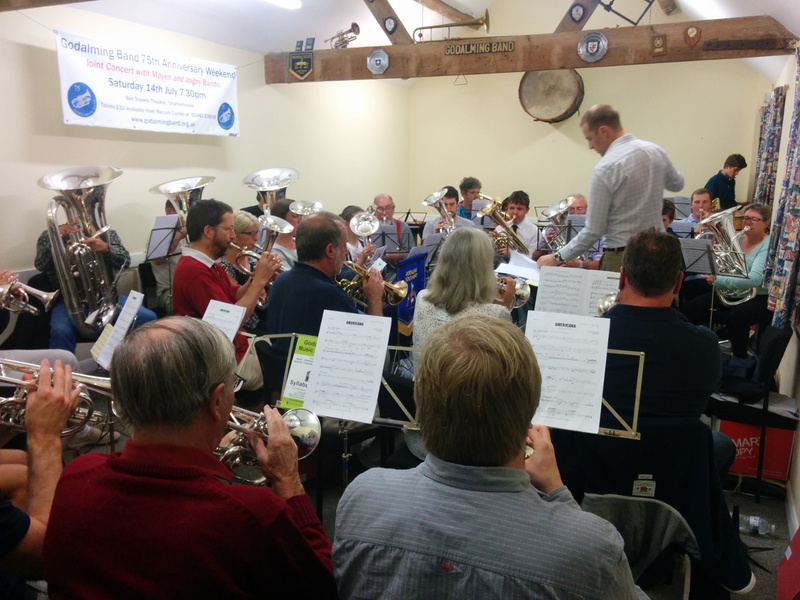 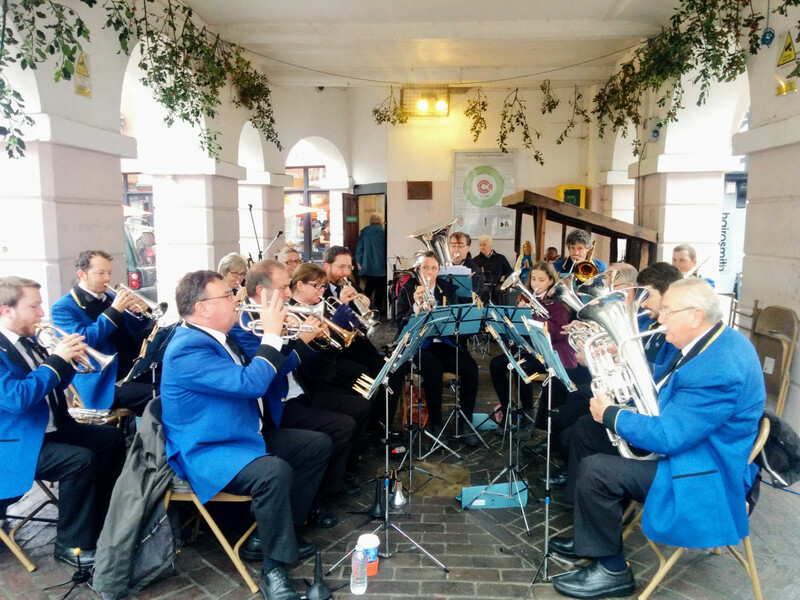 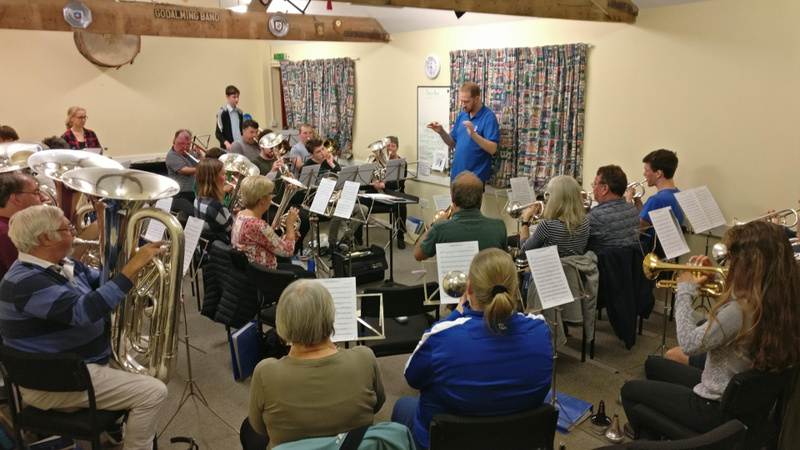 It was a busy November and December as usual for our bands, playing out a few times a week around Godalming and local villages. At our joint Christmas concert, a new band uniform was unveiled, which the band proudly wore on stage for the first time. 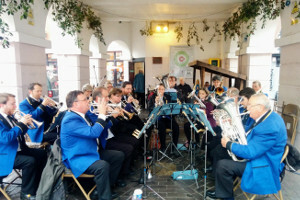 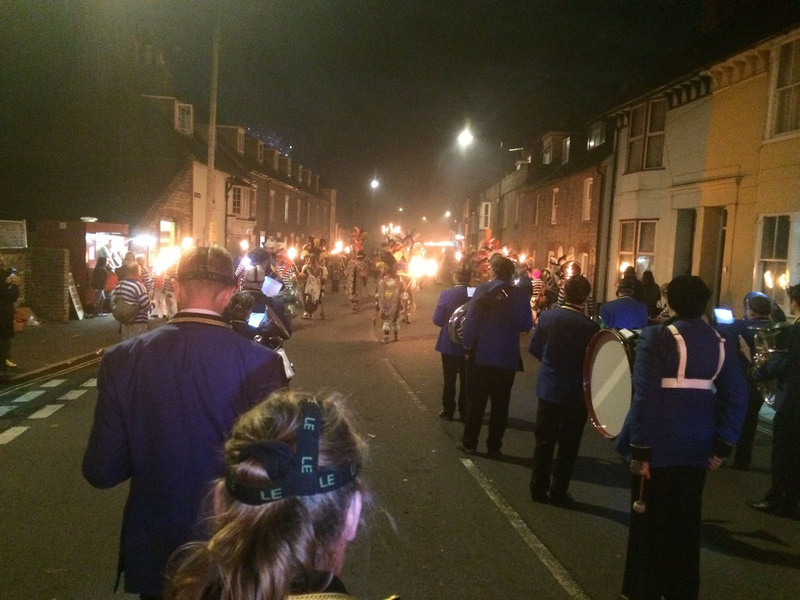 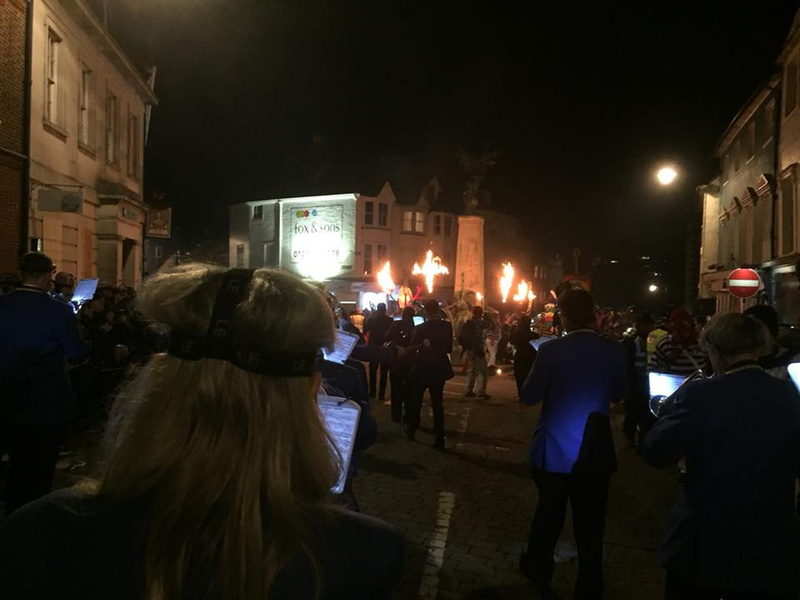 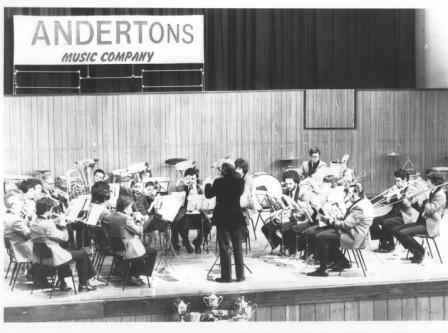 The band’s autumn season started on the local bandstands, but this was soon overshadowed with the world-famous Lewes Bonfire Night where the band marched and played for many miles! 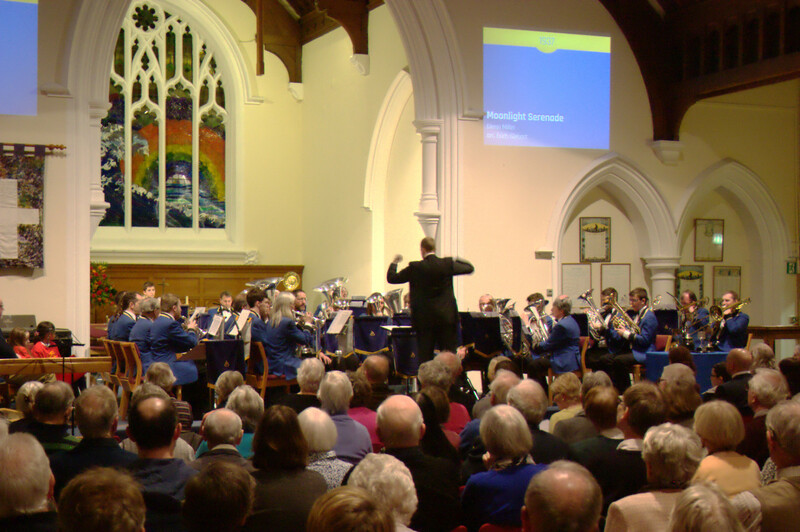 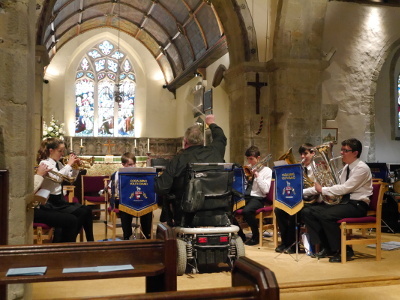 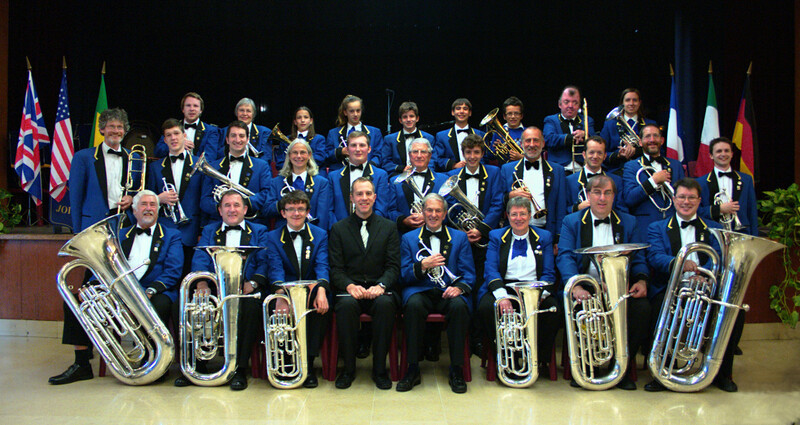 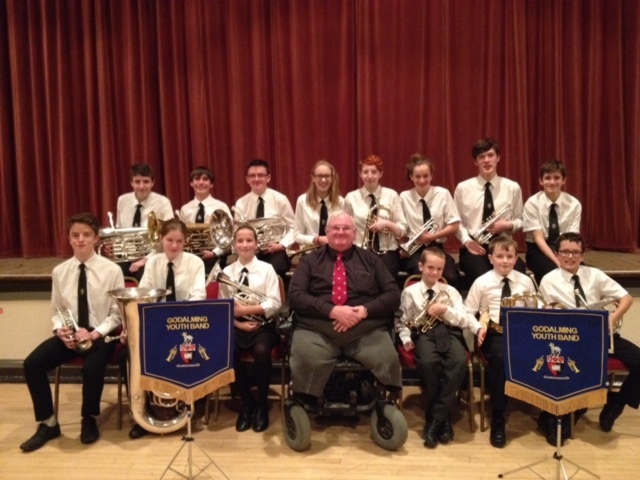 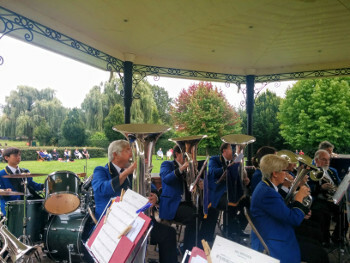 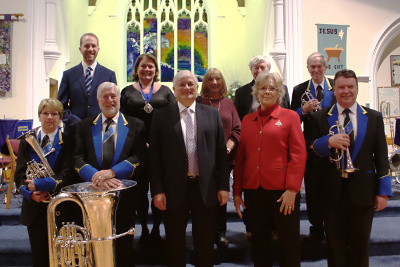 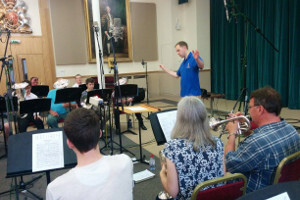 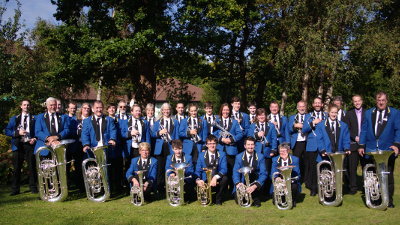 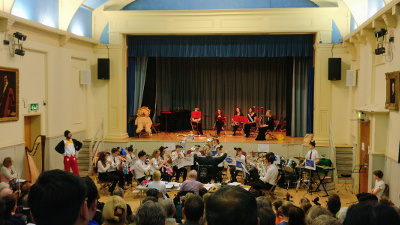 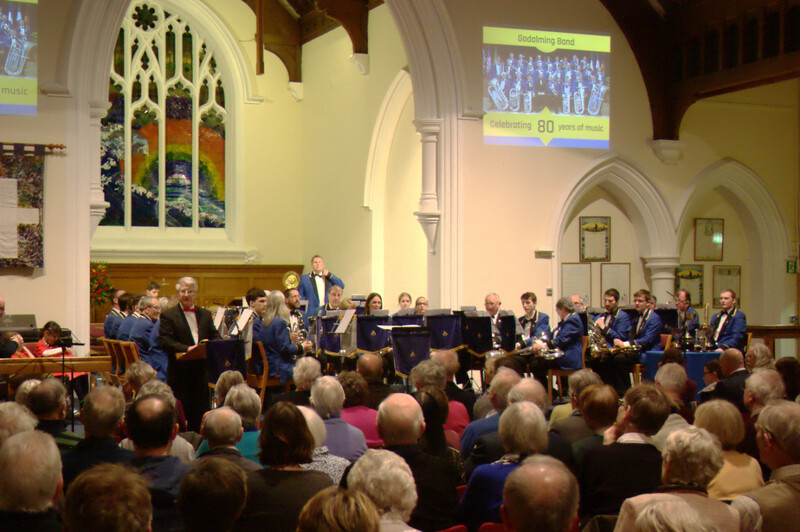 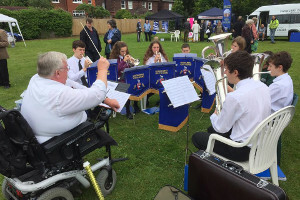 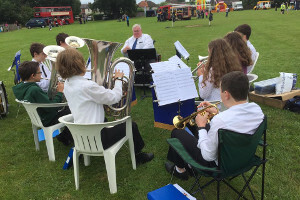 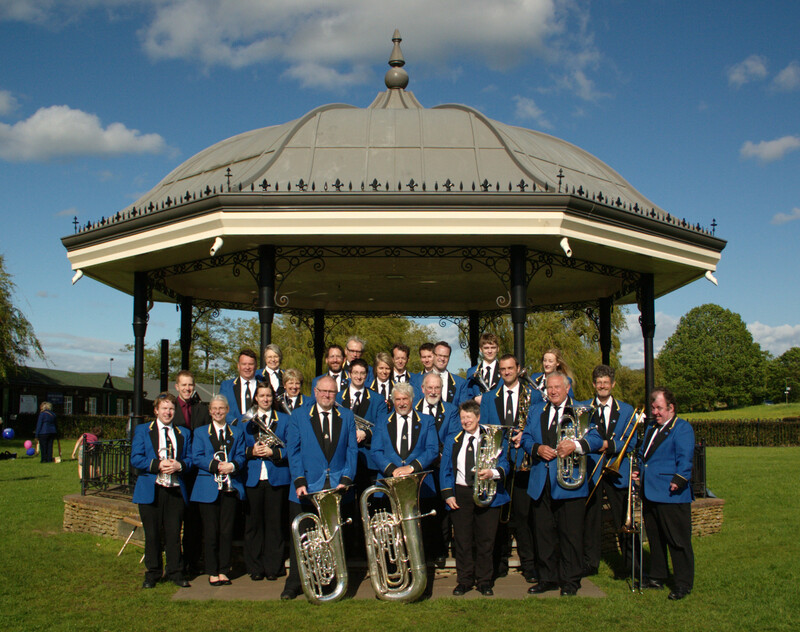 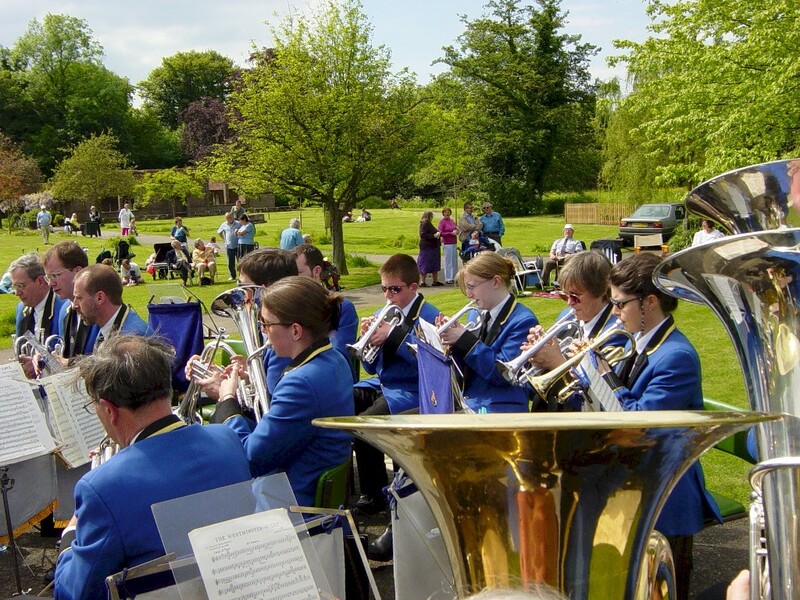 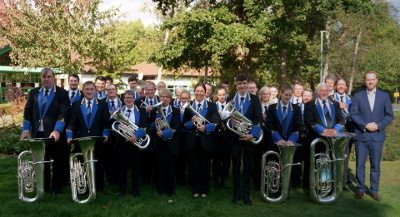 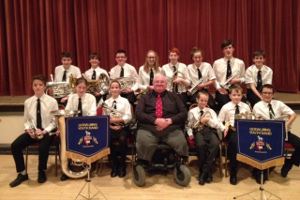 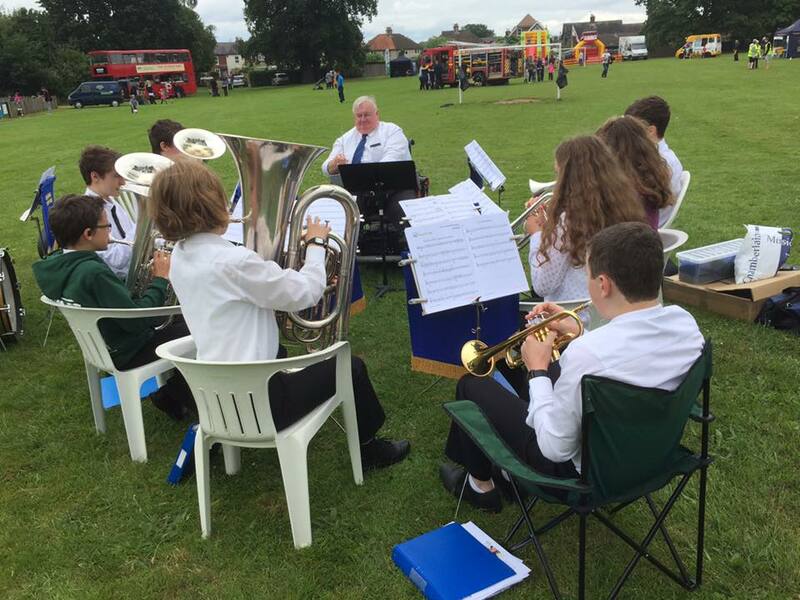 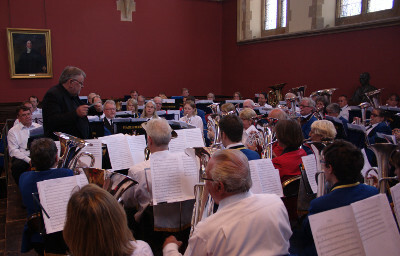 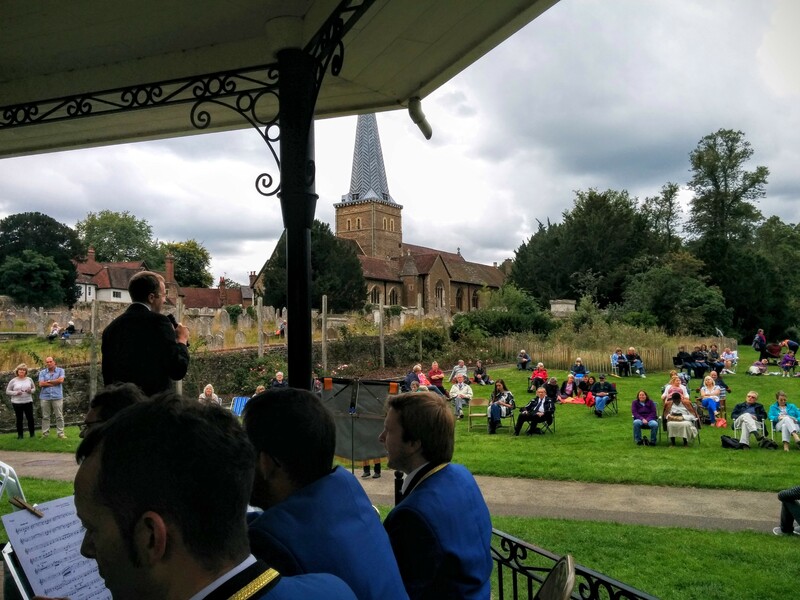 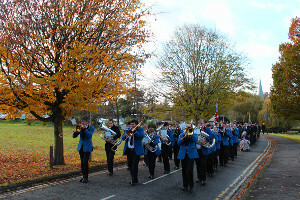 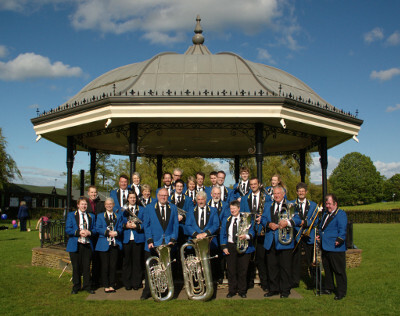 Godalming Youth Band are pictured at a concert in Witley the next day to raise the band’s profile and to invite new players to join. 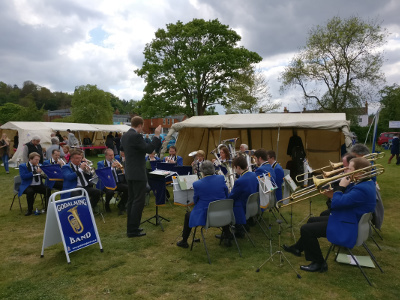 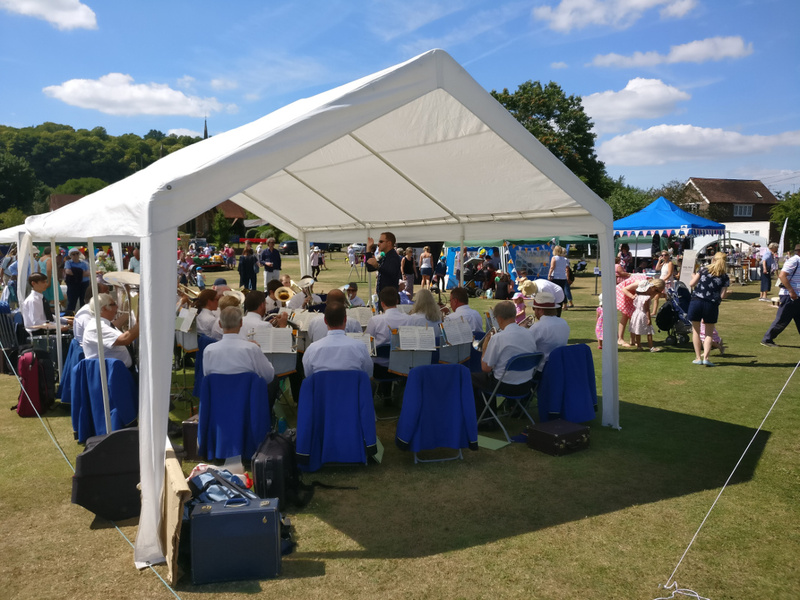 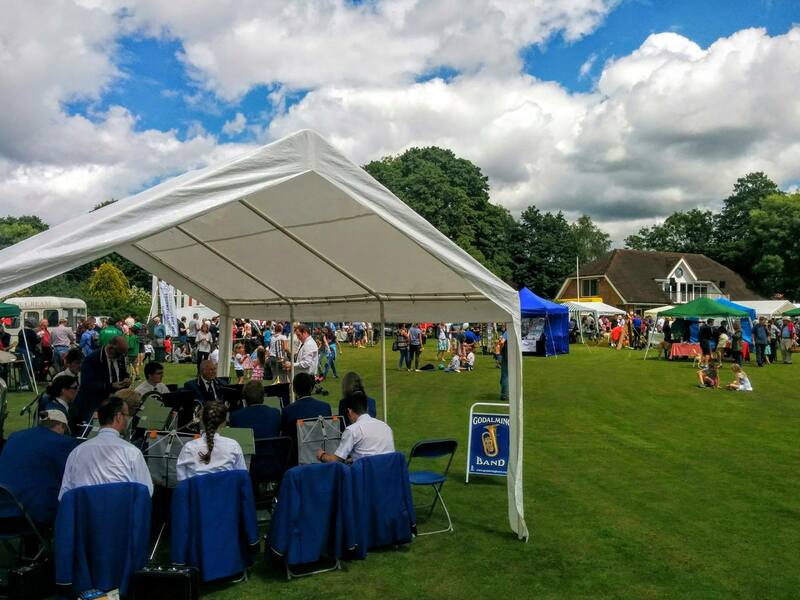 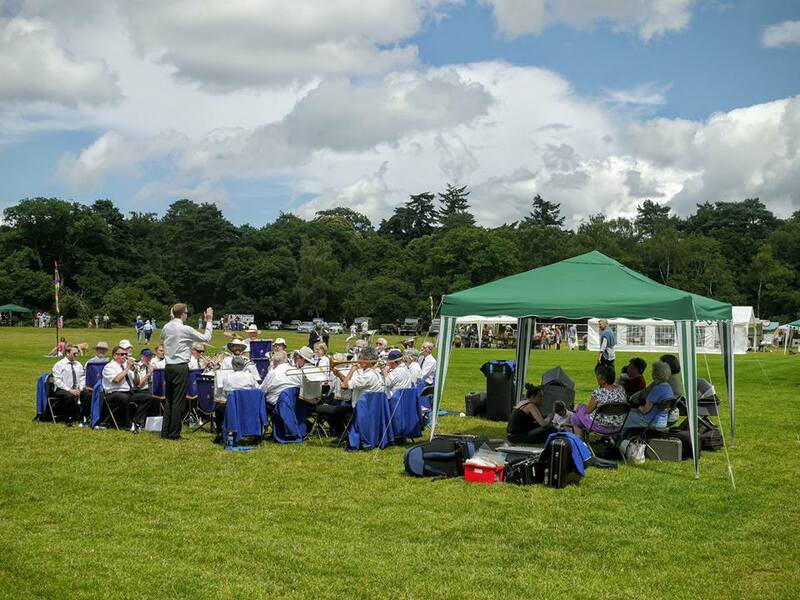 Out and about with both bands at the Spring Fair in Godalming, enjoying the great crowds at the Alresford Watercress Festival, and in the early summer, out in the sunshine at the Wonersh Fete. 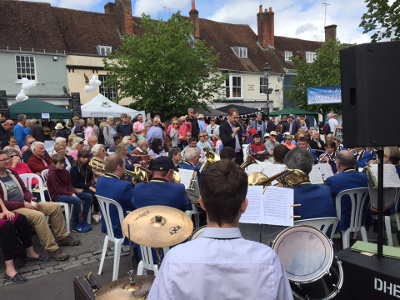 Pictured are our Youth Band with a winning entry at the Godalming Music Festival, front row cornet players being presented with an award at the scaba Spring Contest (courtesy of scaba photos), the band rehearsing before and then pictured after the Autumn Contest. 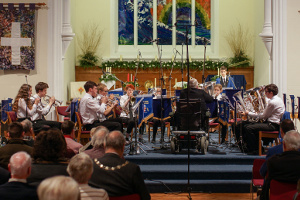 In celebration of the band’s 80th year and Godalming United Church’s 40th year, we joined with Music Kids for a sell-out concert featuring music from each decade. 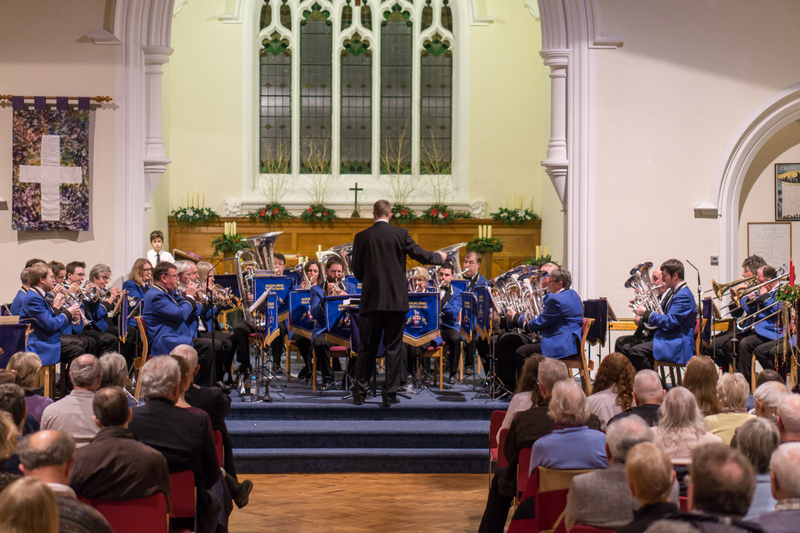 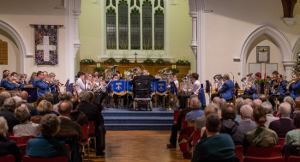 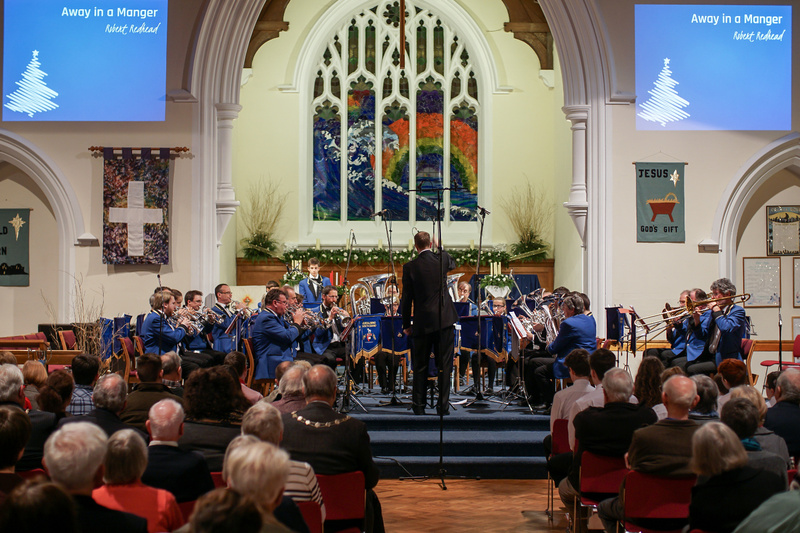 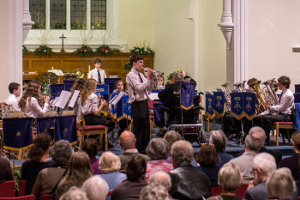 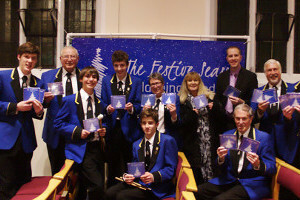 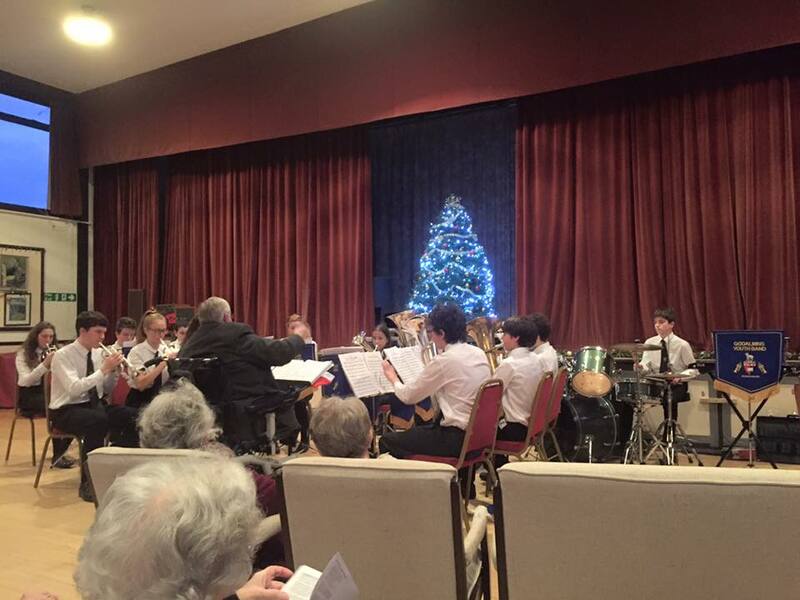 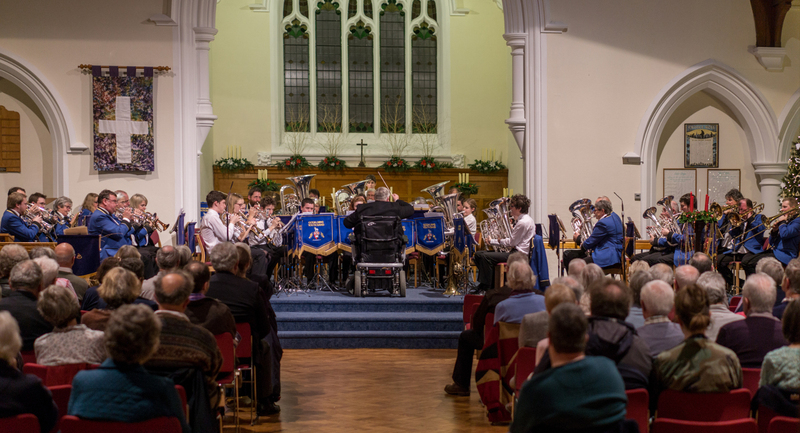 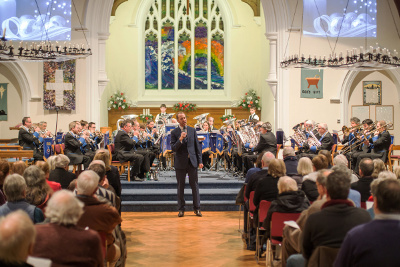 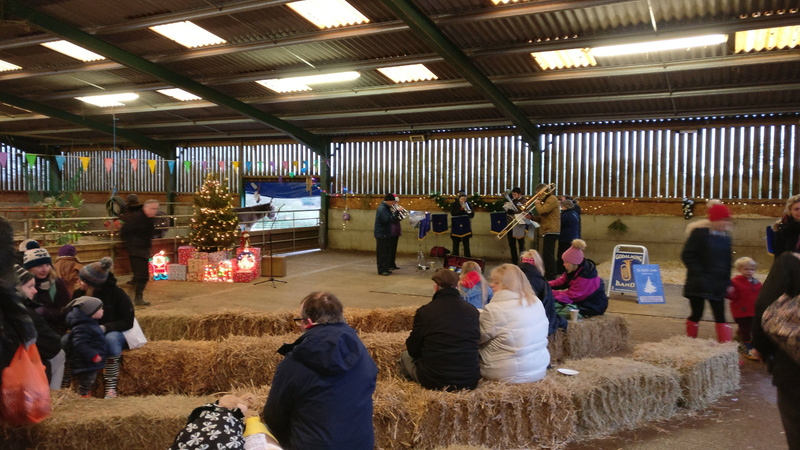 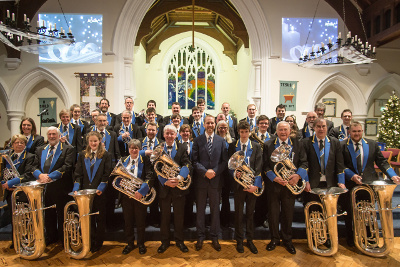 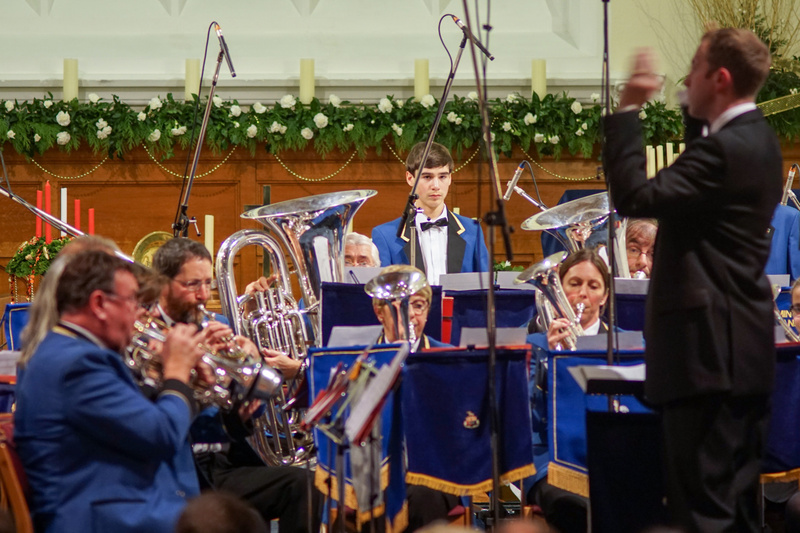 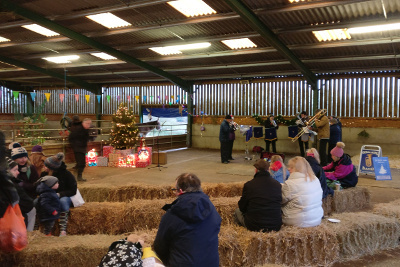 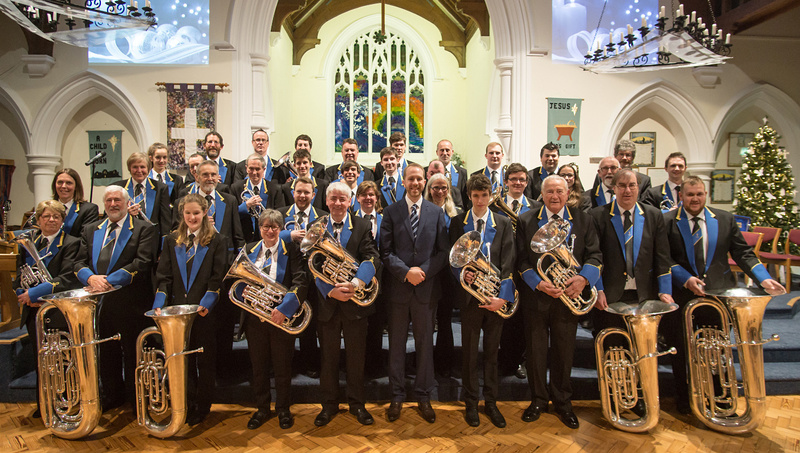 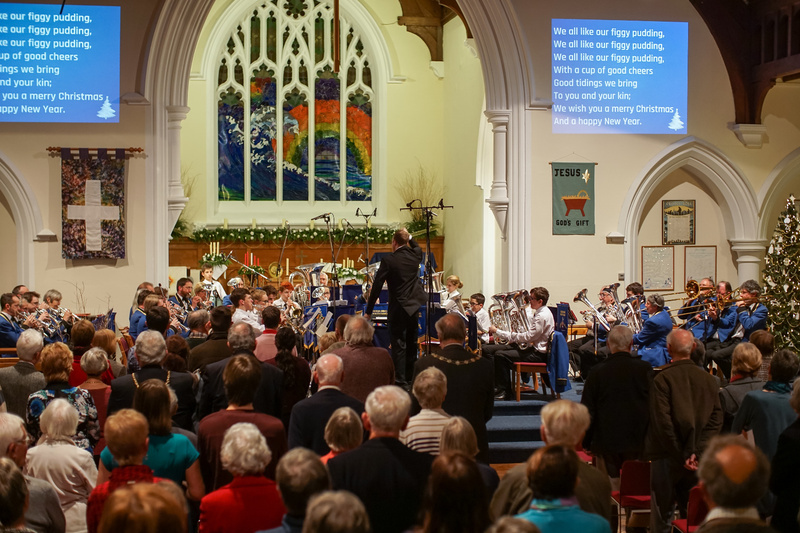 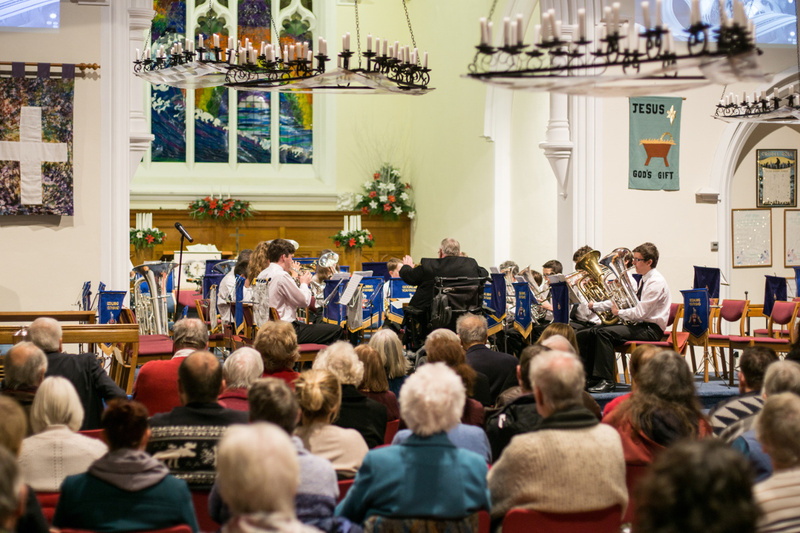 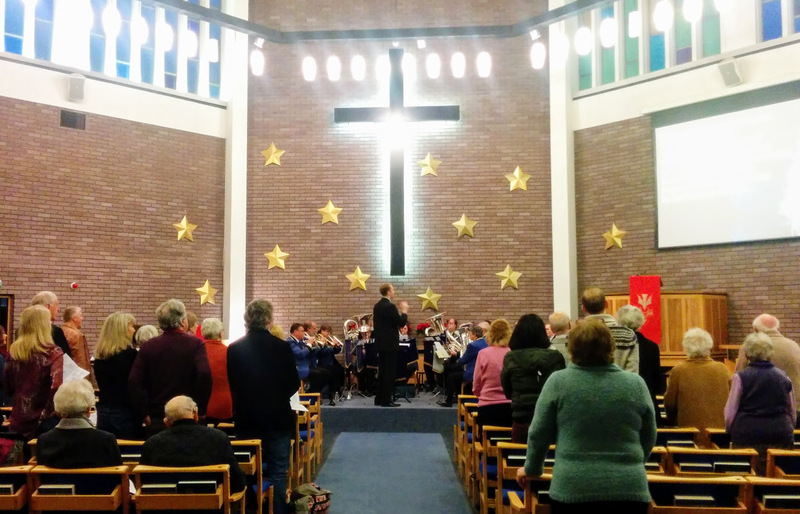 The start of the season was marked with the launch of the band’s new Christmas-themed CD, The Festive Season, and was completed with a Christmas concert with both senior and youth band. 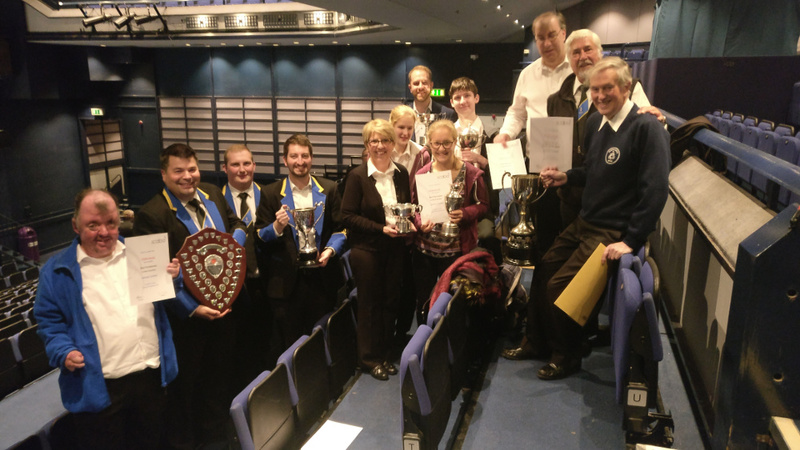 An unusually busy Autumn season for the band, starting with the SCABA Autumn contest where our percussion section and lead percussionist came away with prizes. 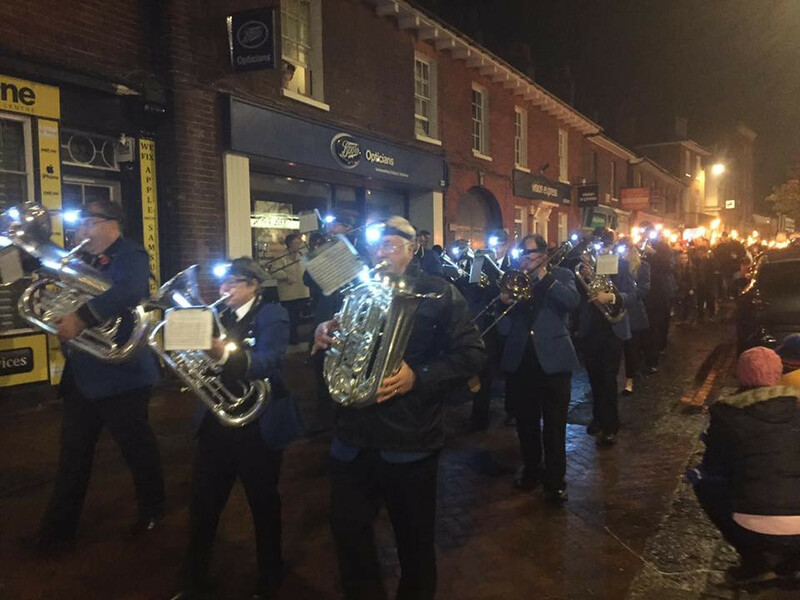 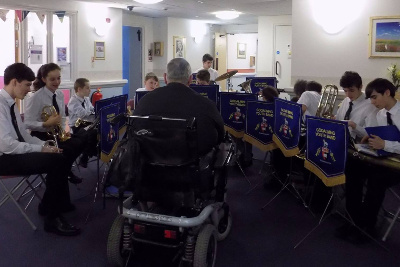 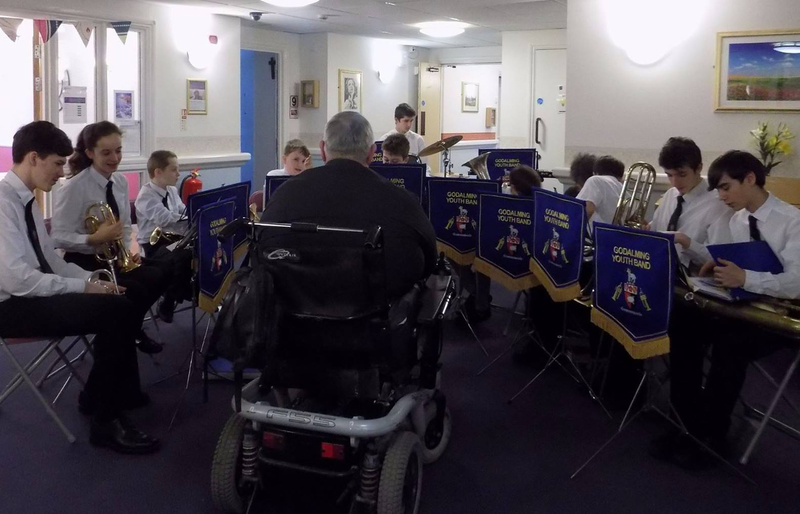 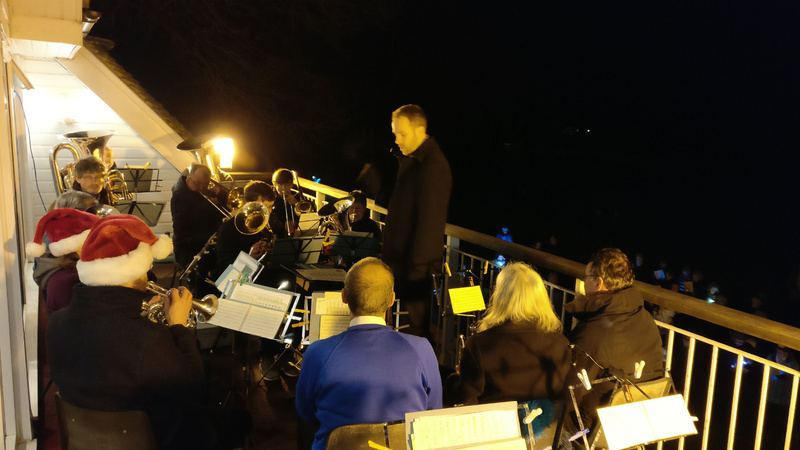 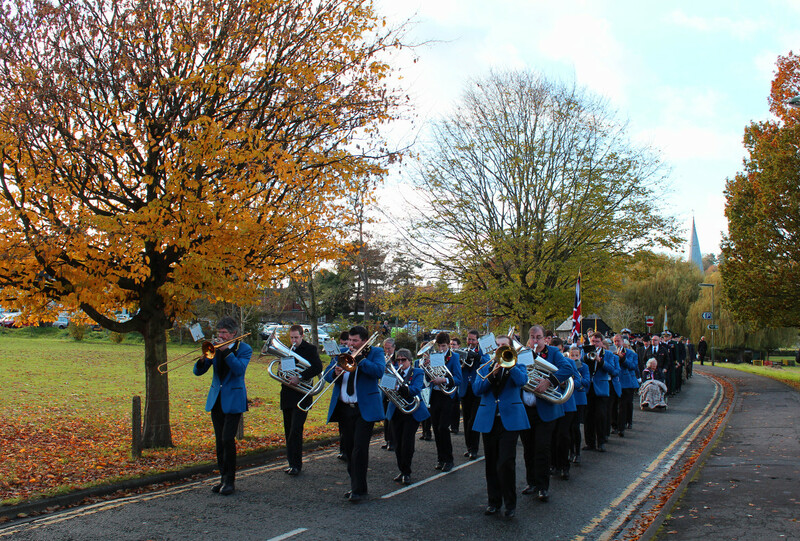 Godalming Youth Band put on a well-attended concert at Elmbridge Retirement Village featuring a programme of World War II-era pieces, and the senior band led the town’s torchlight procession and Remembrance Sunday march. 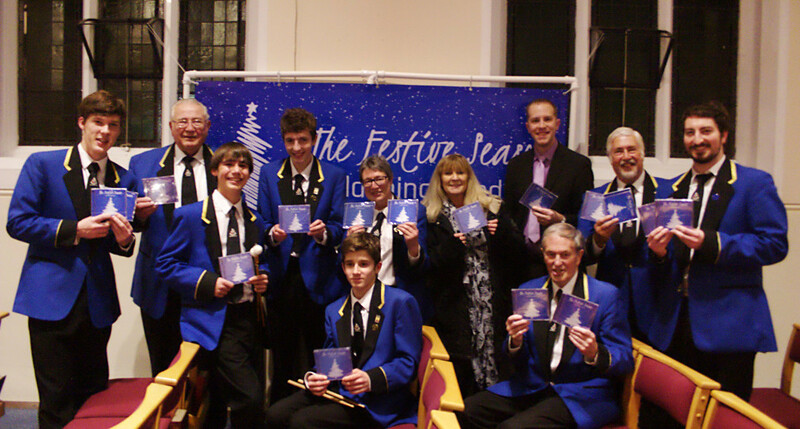 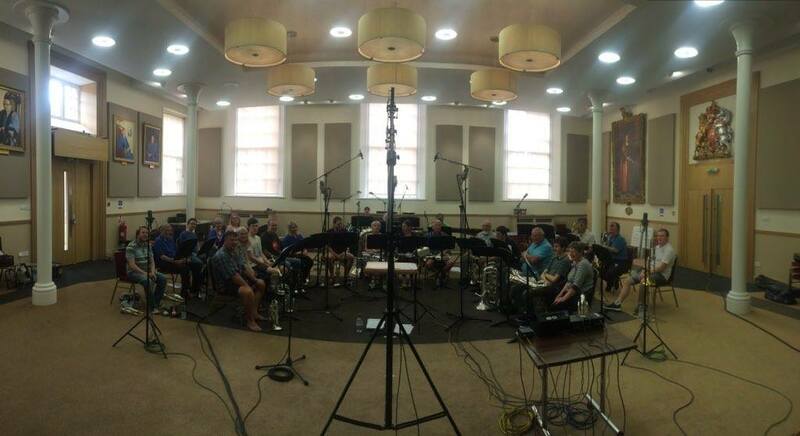 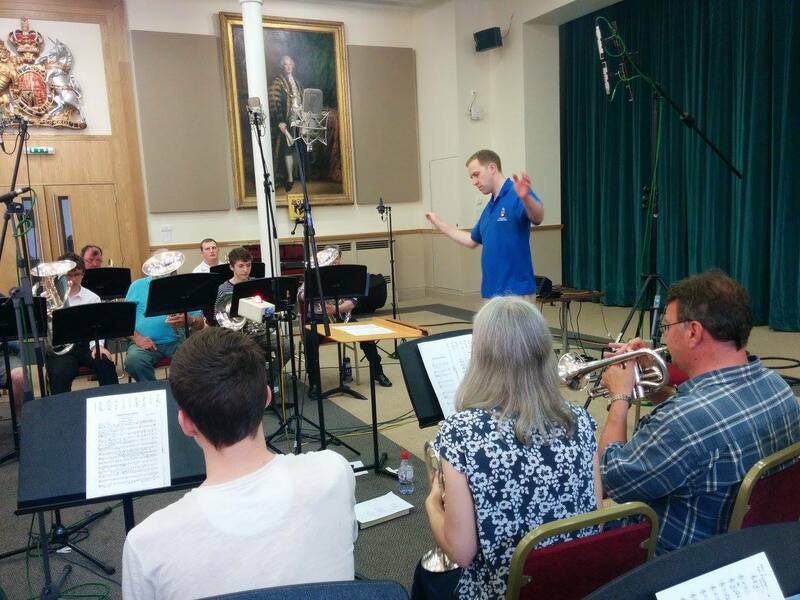 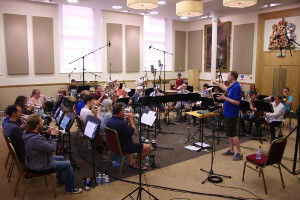 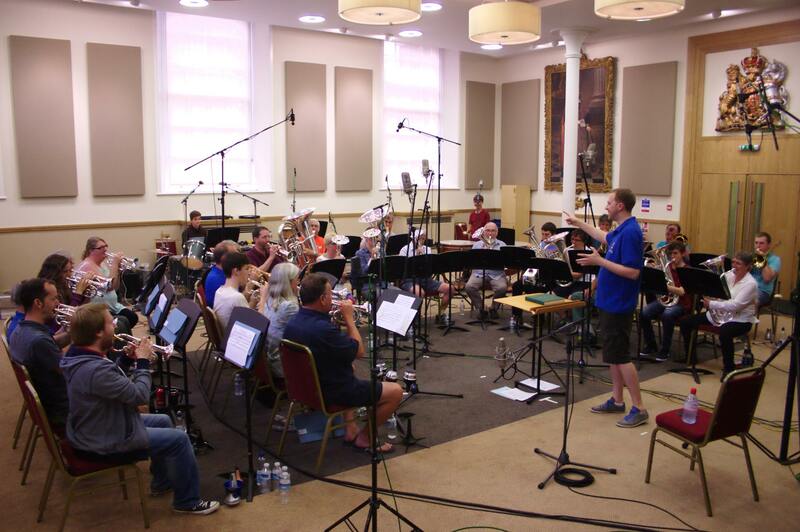 With over twenty years passing since Godalming Band last went into the recording studio, we returned to create new Christmas CD due out later in 2016. Keep an eye out for our launch concert! 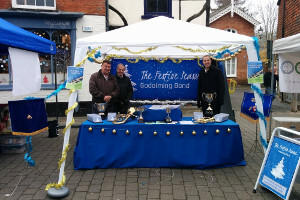 Godalming Youth Band had an excellent round of wins at the Godalming Music Festival in 2016, coming first in three classes and taking home the John Boot Trophy and Jericho Cup. 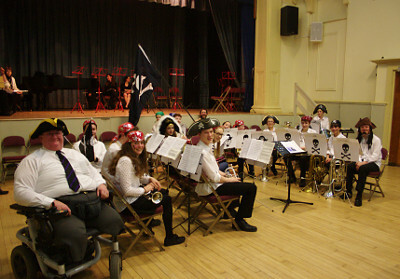 Here they are after playing their winning entertainment item, Pirates of the Caribbean. Our joint Christmas concert with Godalming Youth Band and Godalming Band always rounds off the season. 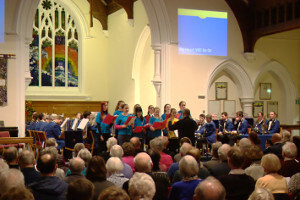 Also available is a video of Godalming Youth Band playing “You Can’t Stop the Beat”. 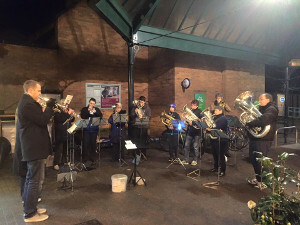 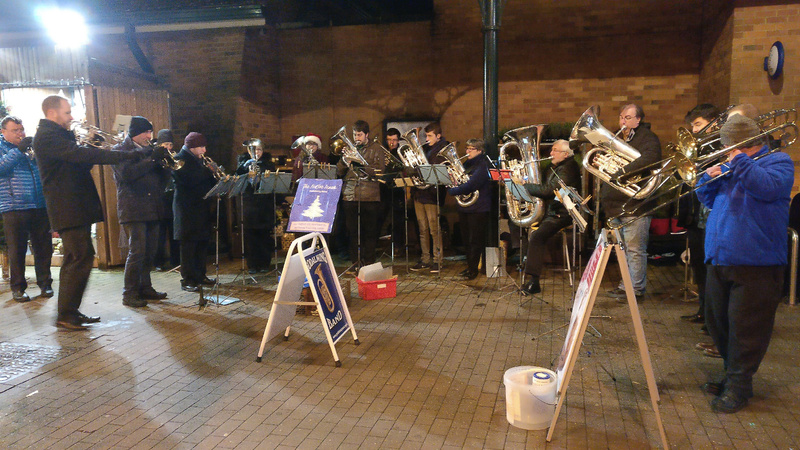 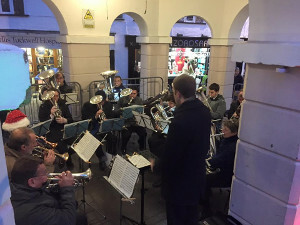 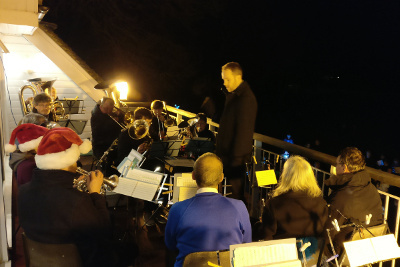 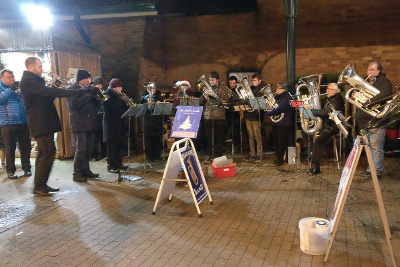 Both of our bands have a busy Christmas season, bringing carols and cheer to the high street, shops, surrounding villages and local residential homes. 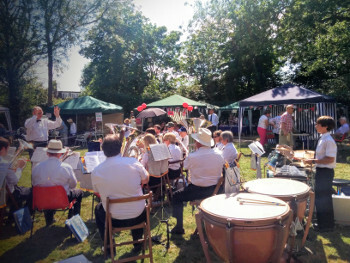 Godalming is twinned with the town of Joigny in France, and for the very special 150th anniversary of Harmonie de Joigny, the band travelled there, along with bands from other twinned towns for a weekend of music. Read about the trip, with more photos and videos. After the traditional Last Night of the Proms, Godalming Band close the bandstand season on the following Sunday afternoon. 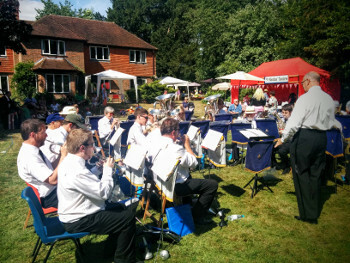 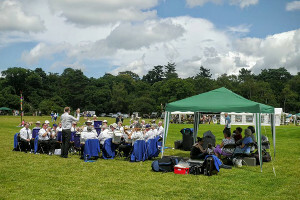 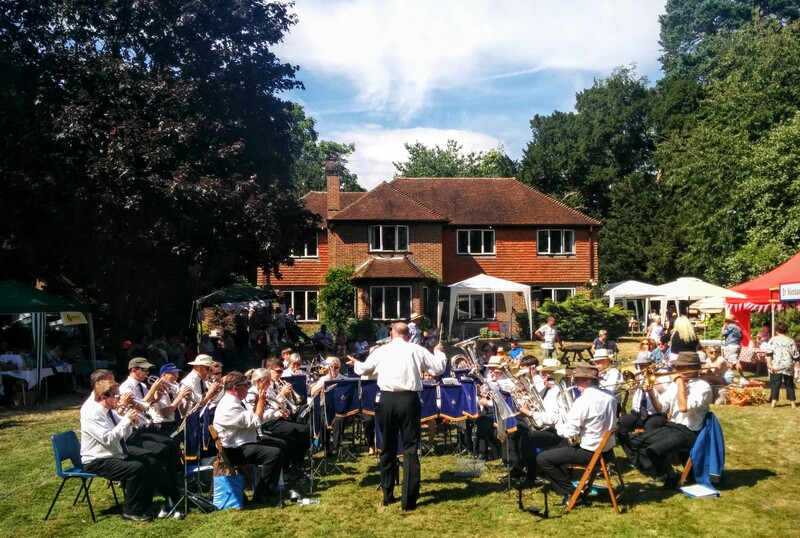 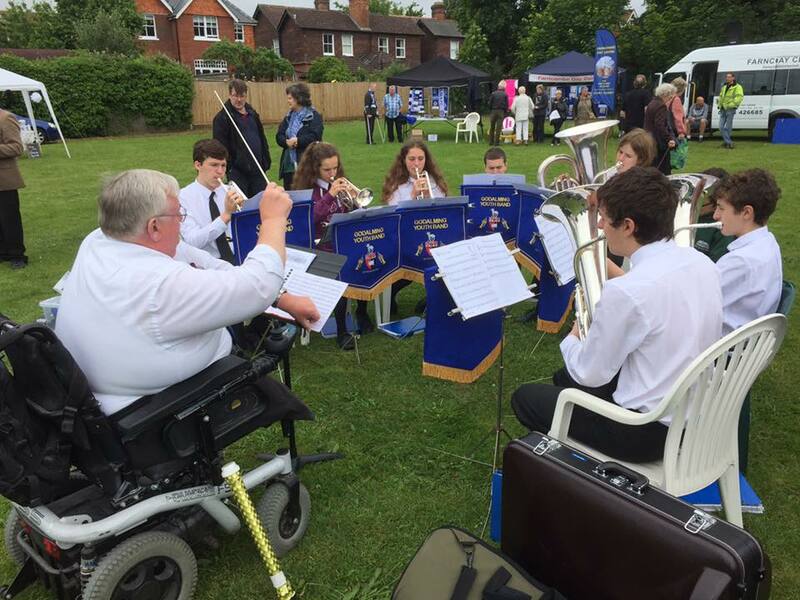 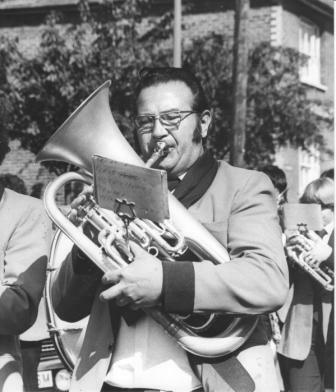 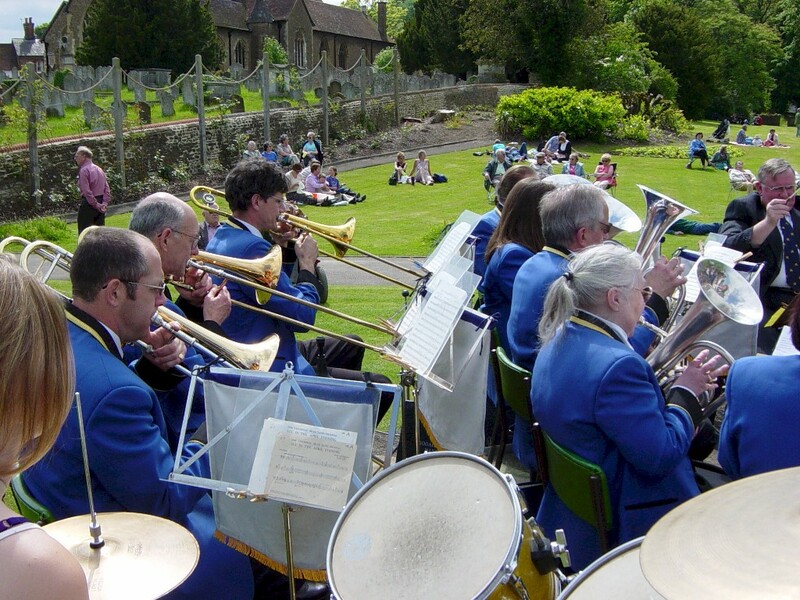 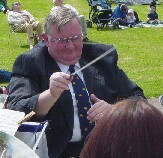 The band play each year at the Cranleigh Rectory Fete, usually a warm job sitting in the sun! 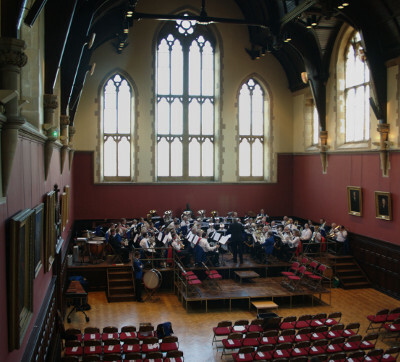 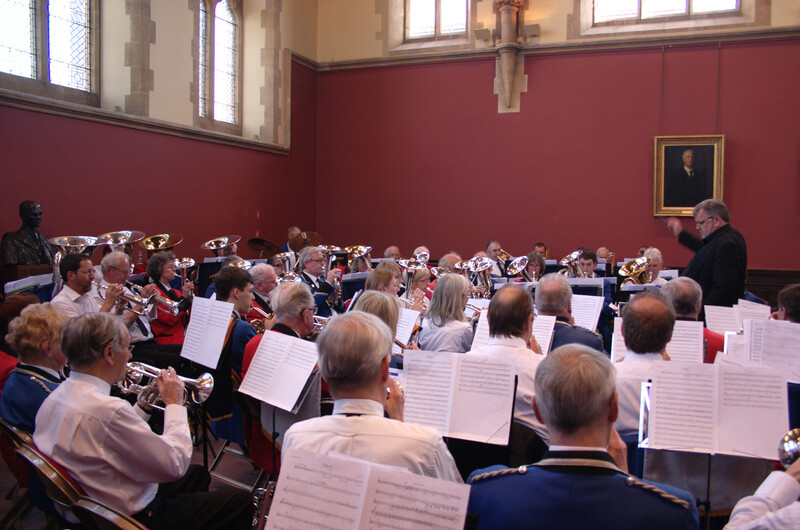 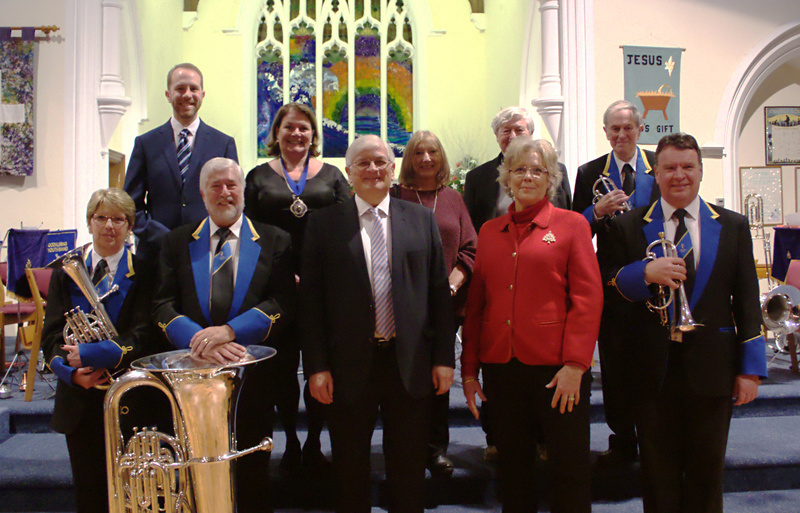 Combined with Farnham Brass Band, Haslemere Town Band and Surrey Brass, we took to Charterhouse’s Great Hall for a massed band concert, raising over £3,500 for Citizens Advice Waverley. 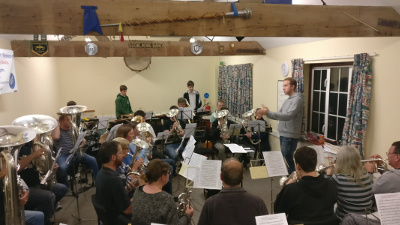 Click on a thumbnail to view the full photo of our joint rehearsal. 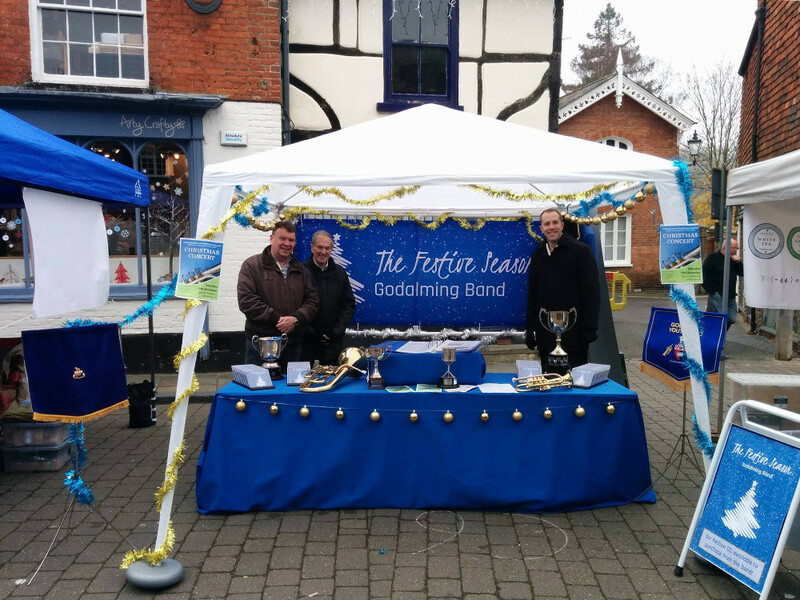 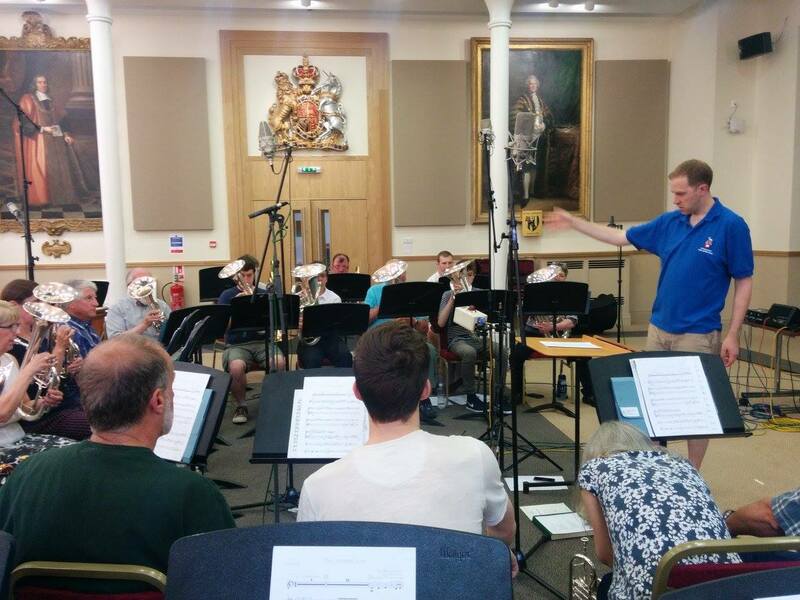 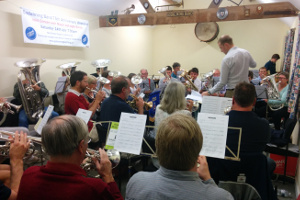 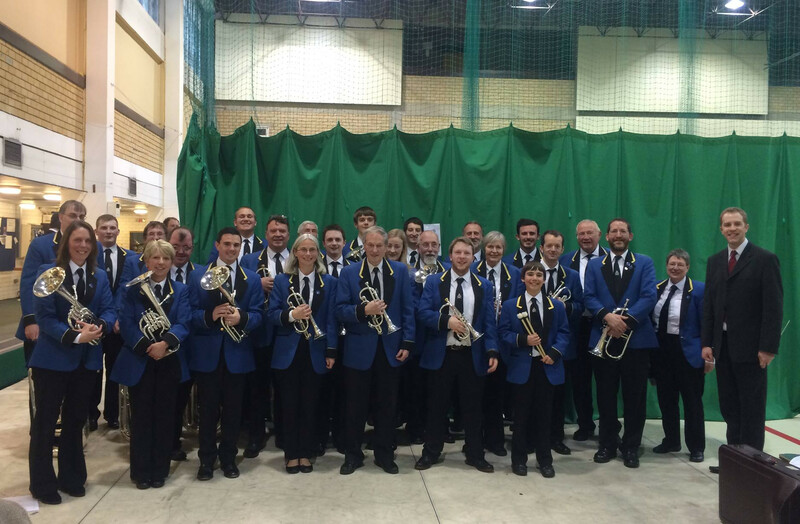 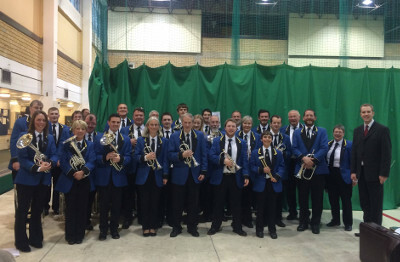 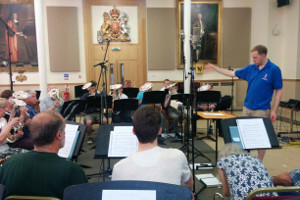 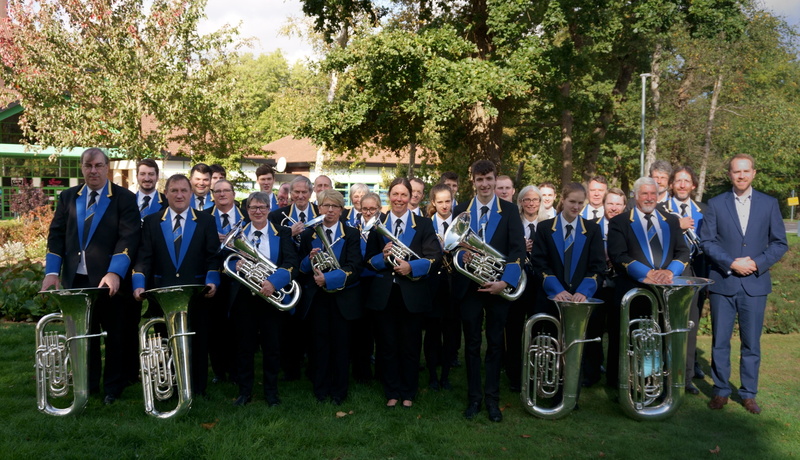 Godalming Band entered the regional qualifying contests for the National Brass Band Championships in March 2015, for the first time in over ten years. 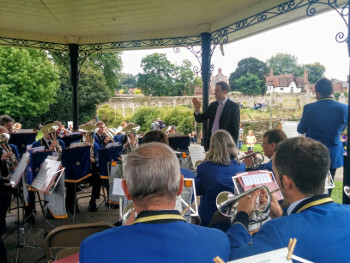 Godalming Band take part every year in Go Godalming's summer of bandstand music, usually with the first and last concerts of the season. 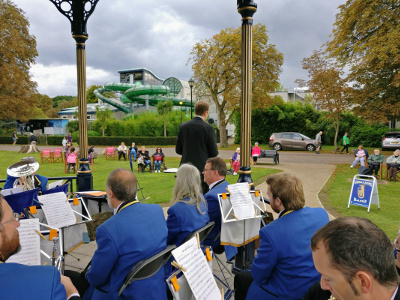 The new Godalming bandstand situated in the Phillips Memorial Park, complete with roof, was opened in 2009. 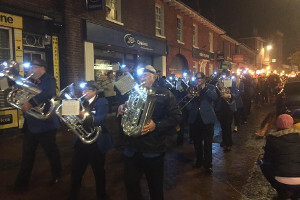 Godalming Band played at the official opening ceremony. 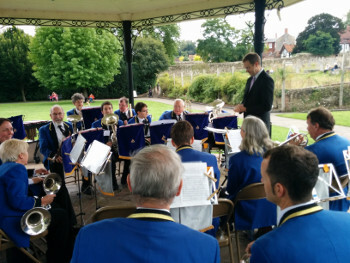 Godalming Band, conducted by David Loftus play a concert in the park in Godalming. 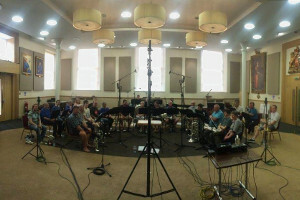 Click on a thumbnail to view the full photo. 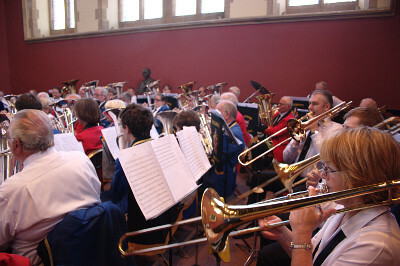 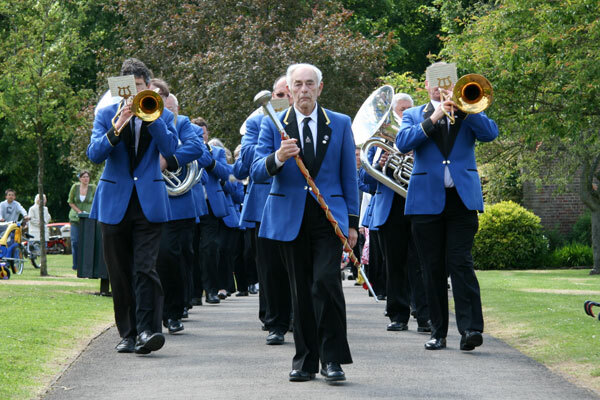 Between the 2nd and 6th June 2006, Godalming Band undertook a trip to Herpen Holland in order to join the the celebrations of 75 years of music with the Sint Hubertus Brassband. 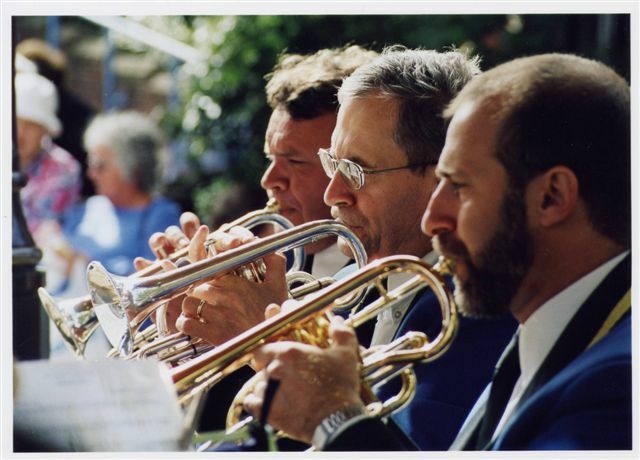 A selection of photographs of the band, taken at Woking Bandstand, 2002. 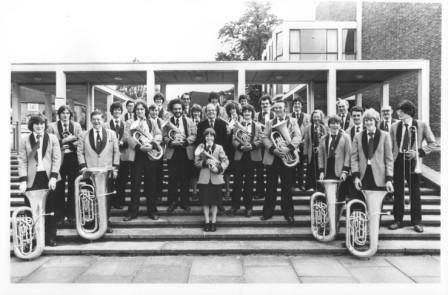 A bit of history - photographs taken of the band in, we believe, the late 1970s. 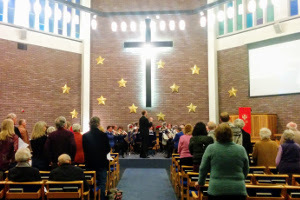 Click on a thumbnail to view the full photo.